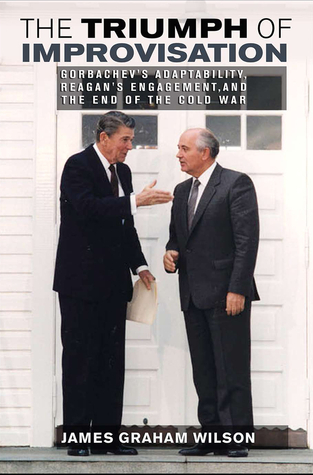 Highly readable and illuminating, in The Triumph of Improvisation: Gorbachev’s Adaptability, Reagan’s Engagement, and the End of the Cold War author James Graham Wilson (@jamesgramwilson) rejects current theories explaining the Cold War’s end and instead focuses on the actions of key individuals in both the U.S. and Soviet governments, primarily U.S. Presidents Ronald Reagan and George H. W. Bush, Secretary of State George Shultz and Soviet General Secretary Mikhail Gorbachev. In different ways, these men eschewed the unproductive rhetoric and actions that defined the relationship of the two superpowers for decades and by doing so changed the world. Throughout, Mr. Wilson’s prose is crisp and his arguments lucid and quite compelling. The book is the product of deep and thorough research, but at no point does the narrative get bogged down. Before beginning I wondered how well a complex subject like the end of the Cold War could be covered in just seven chapters, but by the end I felt Mr. Wilson had more than met the task, enlightening without lecturing. For those who wish to delve deeper into specific events, the end notes provide a great starting point for further research. 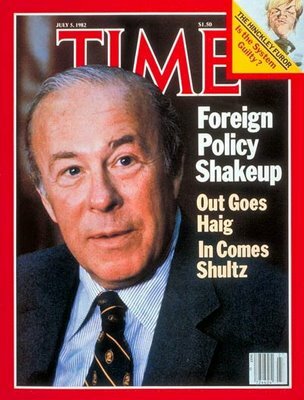 Special emphasis is placed in The Triumph of Improvisation on illuminating the actions of Shultz, who should be remembered as one of this country’s greatest statesmen despite no formal training or prior interest in foreign policy. An economist by trade, Shultz believed the Soviet Union could change and he worked hard to mitigate the efforts of the hardliners surrounding Reagan by emphasizing a Four-Part Framework (bilateral relations, regional matters, arms control and human rights), not letting problems in one area derail the whole relationship. Often heralded as the paragon of conservative values, Reagan is shown to be more complex. His deep-seated desire to eliminate nuclear weapons meant doing something counter to his beliefs: working with the communists running the Soviet Union and thereby implicitly acknowledging their legitimacy. He truly believed the Strategic Defense Initiative (SDI), commonly called “Star Wars,” was the key to eliminating the nuclear threat. Most surprising, once functional Reagan was intent on sharing SDI with the Soviets and the world, something the hardliners around him vehemently opposed and the Soviets (somewhat naturally) did not believe. By preference or political necessity, Reagan surrounded himself with many aides and appointees who did not share his lofty goals, and his lax management style and contradictory statements created turmoil and uncertainty within his staff. By contrast, George W. Bush’s team was cohesive and on message — which proved critical while navigating the turbulent events after the Berlin Wall came down — while their president lacked “the vision thing” his predecessor possessed in abundance. Bush’s prudence provoked criticism from some quarters but given the extraordinary and unprecedented issues he faced caution was more important than boldness. Mikhail Gorbachev lost an empire and won the Nobel Peace Prize in the process. He was as determined as Reagan to see nuclear weapons eliminated — all the more so after the Chernobyl disaster — and he wanted to improve the lives of those in his charge. To do that meant changing the status quo, and after cleaning house of those with different views, Gorbachev set out to reform socialism through perestroika. Of all the players involved in the end of the Cold War, Gorbachev had the most to gain and most to lose. Some could argue he had no choice, that the Soviet system was so broken by the time he assumed the party chair that reform was the only viable option, but even if true he must be lauded for making the choice to move forward toward something hopefully better. It says much about the hollowness of the state he inherited that just a year after the Berlin Wall fell, and seven years after Reagan’s “Evil Empire” speech, the Soviet Union was on the margin of world events with Gorbachev begging the U.S. for loans. — At the beginning of the period covered, each side thought (1) the other side possessed a distinct military advantage and (2) desired their elimination. Conversely, neither side understood why their opposite numbers constantly insisted they were, in fact, the ones trailing behind. — Many of the hardliners working for Reagan, notably Secretary of Defense Caspar Weinberger, were unshakeable in their distrust of the Soviets and pursued agendas that were often counter to that of the president. Proven wrong by hindsight, at the time these men and women were so sure of their views that no opposing opinions were entertained and those who espoused such thoughts attacked. I couldn’t help but make a contemporary comparison to the U.S. Tea Party. 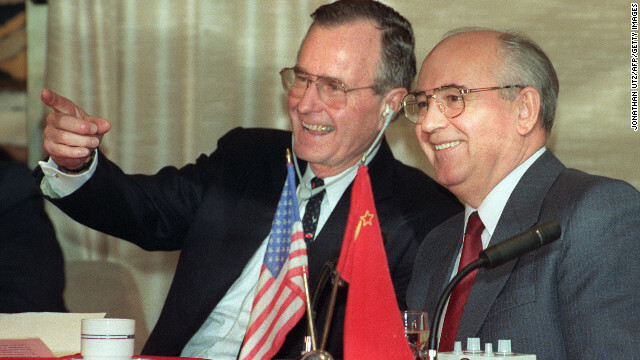 — After Reagan and Gorbachev signed the Intermediate-Range Nuclear Forces treaty in 1987, some hawks in this country said any treat the Soviets were willing to sign must be bad for the U.S. Conversely, any treaty good for us would be anathema to them. Such is the type of thinking that sustained the Cold War. — For those who did not live through this period, having some context about the media and flow of information may be helpful. Although CNN was launched in 1980, the “24-hour news cycle” we live with today evolved over time, defined by saturation coverage of events such as the Challenger disaster (1986), Tiananmen Square protest (1989) and Gulf War (1991). One can’t help but wonder how competing cable news outlets, social media, and the Internet’s free flow of information would have affected — for good or bad — the events depicted in The Triumph of Improvisation. This review is based on a copy of the book provided for that purpose. I must point out that although I am hardly an academic, I lived through the events depicted in The Triumph of Improvisation and was, for much of time covered in the book, serving in the U.S. Navy. My first birthday was just a month after the Cuban Missile Crisis; I grew up, got married and started a family of my own during the Cold War. In grade school I crawled under my desk during Atomic Attack Drills and as an enlisted Sailor in the U.S. Navy I learned how to don a protective suit and decontaminate nuclear fallout. The Soviets were THEM, we were US. Nuclear war was never not a possibility, although admittedly it wasn’t often at the front of our minds. It was simply accepted as being so. Then the Berlin Wall came down and suddenly the world was a very different place. A place where my own kids, who were born in that other time but did not experience it, have a hard time understanding what all the fuss was about when my wife and I share stories about growing up in the shadow of Nuclear Armageddon. Still, given the new realities of international terrorism, perhaps there is some benefit to knowing exactly who your adversary is.